Middle East, April 17th, 2019–UD Trucks today unveiled New Quester in the Middle East, East and North Africa (MEENA). This new version of the brand’s well-established heavy-duty truck introduces a range of enhancements that will enable logistics companies across the region to tackle critical industry challenges and boost their bottom line through Smart Logistics. Fuel efficiency, productivity, connectivity, and supporting and developing drivers are top priorities for fleets and transport companies in the MEENA region and New Quester will address these challenges with new features such as ESCOT (Easy Safe Controlled Transmission)and UD Telematics. To be introduced in fast-growing regions around the world, the launch of New Quester highlights UD Trucks’ unwavering commitment to “Going the Extra Mile” for customers’ businesses. Building on proven robustness and reliability, New Quester introduces key features such as ESCOT automated manual transmission, engines with higher horsepower and user-friendly telematics to deliver greater fuel efficiency, productivity, driver efficiency, safety and uptime. Mourad Hedna, President of UD Trucks MEENA,said: “The truck industry in the region is changing rapidly and customers are increasingly conscious of the total cost of ownership. With New Quester we have the ideal product to address these needs. Moreover, New Quester combines the best of three worlds: UD Trucks’ strong Japanese heritage and craftsmanship; Volvo Group’s innovative technology; and our strong local supportfor our valued customers, which we callour Gemba spirit. New Quester aims to boost productivity and profitability for business owners and logistics companies, for whom a rise in fuel costs consequently increases operating costs. 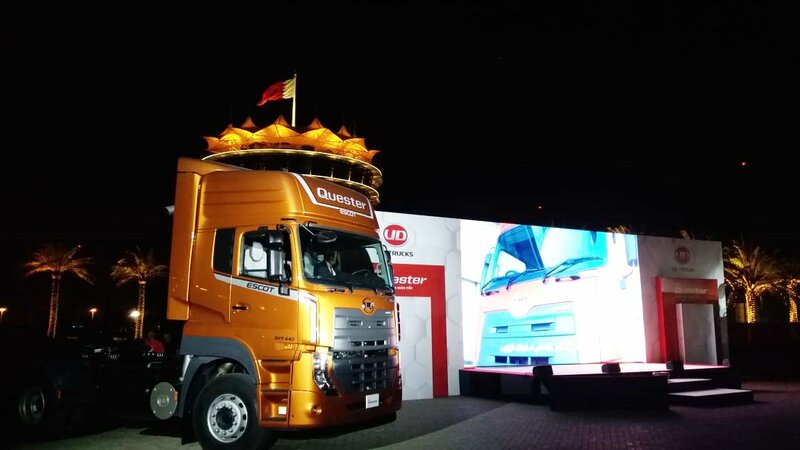 New Quester delivers enhanced fuel efficiency of up to 10 percent over the current Quester. This isaided by the ESCOT automated manual transmission, lighter tare weight and optimized driveline, and is also affected by the operating conditions, driving behavior and vehicle maintenance. ESCOT includes software which optimizes gear shifting according to the engine revs, vehicle speed, loading weight and even road gradient. The smart system also includes a sensor that will select the optimum gear automatically instead of assuming a first gear selection. New Quester’s enhanced fuel performance also aligns with the increasing global focus oncurbing fuel consumption and meetingenvironmentally-friendly regulations in relation to emissions quality standards, all of which effectively reduces thenew model’s overall carbon footprint. New Quester introduces more driver-friendly features to make the driving experience more seamless and comfortable. A game changer in the transportation business, New Quester with ESCOT automatically selects the optimal gear at the right time based on the operating condition. This takes away the need for manual gear shifting which, depending on the transportation operations, happens 1,000 to 1,500 times a day. ESCOT’s automated gear selection also enables drivers to easily adaptto operating New Quester and better focus on driving with ease. In addition to making driving simple, New Quester also aims to help businesses expand the pool of driving talent with an easy-to-operate gear lever that uses a straight shifting pattern. In certain target markets, for example, the number of female Quester drivers is increasing due to its drivability. New Quester opens the doors for companies to attract even more prospects to pursue truck driving as a career and diversify the pool of talent for this role. Driver fatigue continues to be a serious industry challenge, contributingto up to 20 percent of road accidents in the world .To address this, New Quester is developed with an air suspended cab and ride comfort package which reduces cab vibrations by up to 18 percent. Driver comfort is also enhanced by the ergonomic seats and lumbar support for long-distance assignments. In line with elevating business success through Smart Logistics, New Quester supports effective fleet management and driver performance with innovative customer telematics such as real-time vehicle tracking and geofencing for better fleet visibility and optimization.Such smart connectivity features support the increasing trend of new logistics delivery solutions that are offered by technology and local start-up companies in, for example, the Middle East. New Quester trucks are equipped with UD Telematics, which make it possible to connect directly to UD Trucks workshops to monitor and detect each vehicle’s condition and service needs before a potential emergency occurs. Preventive maintenance analysis guides customers via monthly driving behavior and fuel consumption reports, ensuring higher uptime and optimized fuel economy over time. Owners of New Quester also enjoy increased uptime, with the clutch life span being 2.5 to 3 times longer when equipped with anESCOT automated manual transmission as compared to a manual clutch, depending on operating conditions, driving behavior and vehicle maintenance. At UD Trucks, the company’s Gemba spirit means being close to our customers, and listening to their needs in order to be their most valuable partner in their respective markets and segments. Built to deliver UD Trucks’ ethos of “Ultimate Dependability”, New Questerincreases uptimethrough UD Extra Mile Support, which has proved popular with customers across MEENA. Offering an extensive network of well-trained service technicians, it provides quality aftersales service with genuine parts, service planning and vehicle handover training that optimizes fleet performance. UD Trucks recognizes immense potential in the MEENA region, which is one of the world’s most dynamic regions when it comes to construction and development and where business success is a key contributor to economic progress. Combined with the brand’s Ultimate Dependability standard and Gemba spirit, New Quester marks the company’s commitment to championing Smart Logistics and providing unmatched value to customers. For more information on New Quester, visit https://www.udtrucks.com/middleeast/newquester and join the social conversation at https://m.facebook.com/UDTrucksMEENA. UD Trucks is a leading Japanese commercial vehicle solutions provider, active in more than 60 countries on all continents. Since its inception in 1935, the company has been an innovation leader with a clear vision to provide the trucks and services the world needs today. The company is committed to go the extra mile for smart logistics with the most dependable solutions for demanding customers. To best support across applications and geographies, UD Trucks offers a full range of heavy duty trucks – Quon and Quester, medium duty trucks – Condor and Croner, and light duty trucks – Kazet and Kuzer, as well as associated operational and financial services. UD Trucks is a proud member of the Volvo Group, which in 2018 saw a year-on-year increase in sales of nine percent and employs a workforce of 100,000 employees globally.